I LOVE this time of year. Well, lets be honest I love all the seasons, and yet there is something about the fall that allows us to slow down, go within, celebrate family and the holidays and cook super awesome seasonal foods. When I think of fall and winter veggies I think of winter squash, brussel sprouts, onions, garlic, cabbage and potatoes. Spices like cardamom, cinnamon, all spice, nutmeg, and pumpkin spice. And then herbs like sage, rosemary, and thyme. So I thought id put together a few recipes highlighting some of these players for ya. This is a great way to use the wonderful flavors of winter. And you can feel free to use different squashes, sweet potatoes or yams. Peel the squash with a vegetable peeler. (I spent years doing it with a knife because I thought the skin was too tough for a peeler. I was wrong.) Handling the peeled squash is an interesting thing. The moisture that oozes out of it will quickly dry into a tough film on your skin. You can alleviate this somewhat by wetting your hands before you peel it. Cut the squash in half lengthwise and scoop out the seeds. Chop up into 1.5” chunks, put in a pot, cover with water and boil for about 18 minutes. They are done when you can push a knife easily through a chunk. Don’t over cook or the end result will be mushy. Drain well in a colander, put back into the pot and back onto low heat and let them steam dry for a couple of minutes. Add the butter, maple syrup, cinnamon, pepper and salt and mash with a potato masher until the consistency of thick mashed potatoes. Serve with a dollop of butter and top with fried sage. 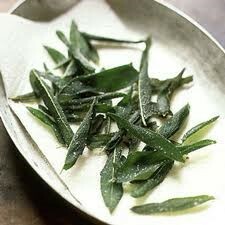 In a frying pan, melt butter of med heat, add whole sage leaves, fry both sides til crispy. Throw it on top of squash, pork, chicken, or anything else you’re inspired by. Brussel sprouts are one of my favorite veggies and this is such a wonderful way to bring out the flavors and colors of this mini cabbage. 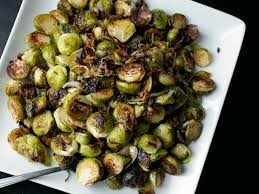 In a large bowl toss the brussel sprouts, onions and garlic with olive oil, balsamic, salt and pepper. 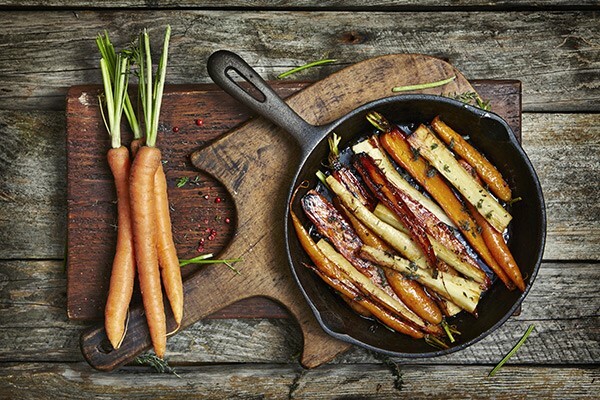 Pour veggies onto a cookie sheet and give a little wiggle to even them all out. Sprinkle with the chopped herbs. Roast for about 30 minutes or until nicely browned and caramelized. Serve immediately. Many people don’t think to shred their vegetables, but it’s a fun way to change up the texture and get your veggies in raw. This salad is beautiful when presented, and then when tossed the juice from the beets turns the whole salad a deep red. Make the dressing by combining all ingredients in a jar closed with a tight lid and shake until well emulsified. 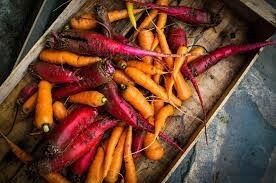 For the salad, shred the beet, carrot, and zucchini with a cheese greater or food processor, keeping each vegetable separate from the other. Divide a few large lettuce leaves between four small plates. Top with shredded zucchini, then carrot, then beets. Drizzle dressing over each salad and top with 1 oz goat cheese. Use this as just a basic formula and play around with the combinations of veggies, herbs and spices. In a large bowl toss the veggies with the olive oil and herbs, place on a baking sheet or roasting pan and sprinkle liberally with salt and pepper. Roast, stirring occasionally, until the veggies are tender, about 25-30 minutes. Serve.